While living out on Camano Island, Mike Scarce has perfected his hobby of making what he calls “Cabin Art”. These pieces fit into any rustic hideaway’s art collection. His materials include: reclaimed wood, salvaged wood boxes, used cabinet doors, old address numbers and letters, old wire, fasteners and nails, and ads that are collected from years of old magazines, left to him by a relative. He has found most of these materials at The RE Store. “I always find some interesting materials to use. I like to go a couple times a week to The RE Store because you never know what is going to come in,” says Mike. To get started on a one of his projects, Scarce likes to take old windows and replace the glass with plywood. He uses ads from the old magazines or he will use ads that other people bring to him of their classic cars. The ads are bonded to the wood. 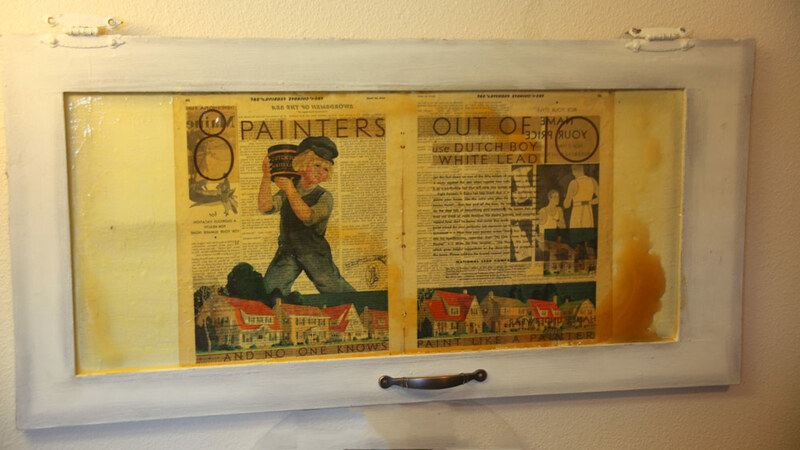 The artwork is preserved with a clear sealant that he found at the Bellingham store. Mike says that when he seals and stains the artwork, the older the wood, the better. Wire and nails are used to finish and hang the piece. Most of his artwork is on display at the Schuh (pronounced Shoe) Farm produce stand in Stanwood and Mount Vernon. 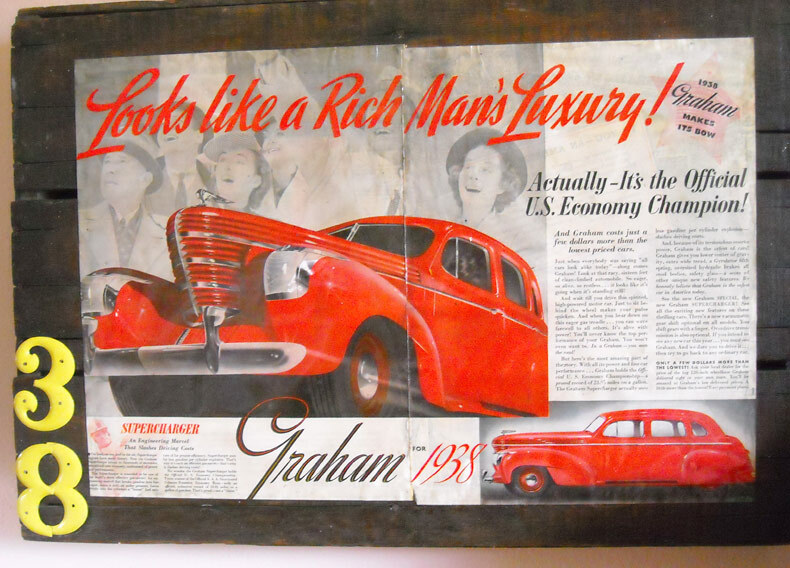 Scarce sells most of his art to cabin owners on Camano Island, but he said that some pieces have found homes in barbershops, a fire station, and with car collectors, who admire old car ads. He has donated a piece to The RE Store in Bellingham that suits the paint section. See photos of creative reuse with reclaimed wood furniture from The RE Store’s REvision Division.